I have been psyched to see Cowboys & Aliens since I saw the first trailer nearly a year ago. For those who haven’t heard of it because they’ve been hiding somewhere under (or more likely off) this rock for the past several months, Cowboys & Aliens, perhaps the summer’s most anticipated film (by me, in any case), is a science fiction Western starring Daniel Craig and Harrison Ford, directed by John Favreau. 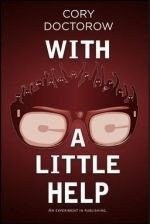 The movie is based (however closely or loosely has yet to be determined) on the 2006 comic (‘scuse me, “graphic novel”) of the same title, created by Scott Mitchell Rosenberg. Science fiction and a Western. (You had me at ‘scifi’.) But how, exactly, does one combine the two genres? And of course there’s the seminal space-Western, the television show Star Trek. (Do I really have to say “The Original Series” when I mention it?) In Gene Roddenberry’s original pitch of the show to Herb Solow he calls it “a Wagon Train concept” – only in space. Star Trek also often made use of actors who had experience in Western films: Jeffrey Hunter from The Searchers (1956) played Kirk’s predecessor Christopher Pike, and DeForest Kelley (Dr. Leonard “Bones” McCoy) appeared in Gunfight at the O.K. Corral (1957). And in a completely unsubtle Western allusion, in the episode “Spectre of the Gun”, Kirk’s crew must relive the events of that O.K. Corral shootout in an alien-manufactured surreal replica of Tombstone (except Kelley plays a Clanton instead of an Earp in this one). But Cowboys & Aliens takes place on Earth, not in space or on some other planet. This type of crossover isn’t technically a ‘space-Western’; it’s more properly labeled ‘scifi-Western’. A scifi Western takes place in the historical American West (or occasionally in an alternate-history West), but with scifi elements such as aliens or futuristic technology. (Note that C&A has both.) 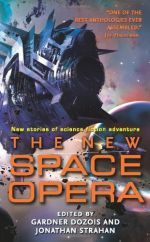 While space-Westerns bring elements of the Old West into traditional scifi settings, scifi-Westerns instead take elements of scifi and put them into traditional Old West settings. Perhaps the earliest scifi-Western film is the early serial The Phantom Empire (1935), complete with robots, an underground civilization, and singing cowboy Gene Autry in one of his earliest movie appearances. Wild Wild West (both the 60’s television series and the 1999 film) and the 90’s series The Adventures of Brisco County, Jr both fit in this category as well, since in both the protagonists fight with (or sometimes against) futuristic gadgetry. These last two examples seem to imply that steampunk might qualify as scifi-Western. 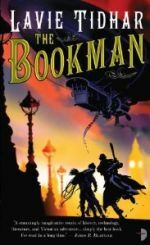 While there certainly is some crossover between the sub-genres, if it doesn’t take place in the Old West, it’s just plain old (extra)ordinary steampunk. I admit I had a hard time this month waiting for Cowboys & Aliens. I decided I would have to get my scifi-Western fix by reading some if I couldn’t watch any. But first I had to find some to read. Unfortunately, stories in this very specific subgenre aren’t too common. Edgar Rice Burroughs’s Martian tales might count as scifi-Western. 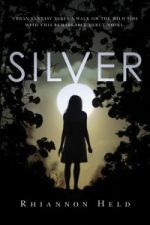 After all, John Carter was a retired Confederate soldier mining gold in the Arizona mountains, so he was at least in the right time period and in the right part of the country at the start of his story. But most of his adventures take place on Mars, and there’s already a label – ‘sword-and-planet’ – for his type of story, anyway. Besides, I’d already read through them all recently (see RSF#1). 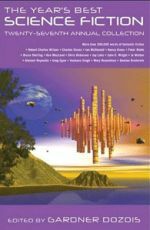 I did find an excellent piece by Tony Daniel, “A Dry Quiet War” (in Asimov’s Science Fiction, June 1996), which deserves mention even though it is technically a space-Western (by my own definition), since it is set on the planet Ferro instead of Earth. It could easily be set in Earth’s Old West, though (thanks to temporal displacement), so I want to call it a scifi-Western anyway. The protagonist, Colonel Henry Bone, is a time-traveling biotech-enhanced space marine who has retired back to his ranch in his home time, but a few buffed-up vets from way out of town show up and decide they don’t want to settle down so much, shooting up the town and beating up Bone’s girlfriend. The problem is that if Bone interferes it can alter the outcome of the Big War at the End of Time which he just got finished fighting. The author himself has said a direct inspiration for the story is John Ford’s films, so you can maybe guess what Bone decides to do. 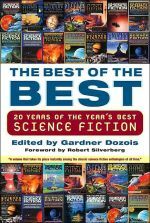 For those readers who didn’t hang on to their scfi magazines from fifteen years ago, the story has been anthologized by Gardner Dozois in his 2005 Best of the Best (reviewed in RSF#8). Another classic scifi-Western is “Night of the Cooters” by Howard Waldrop (in Omni, April 1987). It retells the story of the Martian invasion in H.G. Wells’s War of the Worlds (see RSF#11), but this time from the point of view of Sheriff Bertram Lindley of Pachuco City, Texas. It appears that more than just London was targeted by the Martians, and the sheriff and his deputies have to figure out how to deal with the mysterious cylinder, heat rays, and tripod war machines. Let’s just put it this way: It’s Texas, so they aren’t going to lie down and let the invaders walk all over them while waiting for the Martians’ immune systems to fail like them folks in England did. This action-packed, tongue-in-cheek tale, which Waldrop dedicates to Slim Pickens, is a great homage to Wells (and to Texans). It can be found in Waldrop’s eponymous anthology Night of the Cooters (1990), and also in Kevin J. Anderson’s War of the Worlds: Global Dispatches (1996), a collection of similar retellings of the Martian invasion by various authors (in the guise of various other authors). 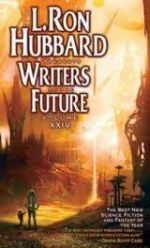 After these two, other scifi-Western tales seemed harder to come by, until I discovered an annual publication devoted to the subgenre, Science Fiction Trails, edited and published by David B. Riley. Now in its sixth issue, the annual is a continuation of Trails, Intriguing Stories of the Old West, and counting that publication its history goes back a full twenty years. The most recent two issues, #5 and #6 (both copyright 2010), are currently still available, so I picked them up. They’re perfect-bound magazine-sized paperbacks with full-color covers, ranging from 72 pages to 93 pages (#5 and 6, respectively). 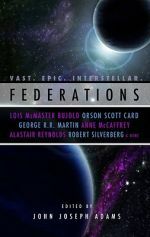 The cover art by Laura Givens (#5) and Russell Morgan (#6) is exceptional, with both detailed portraits featuring a traditional “Grey” alien on horseback. The tag line of SFT is “Where Science Fiction Meets the Wild West,” and for the most part this is true, including steampunk, alternate histories, alien encounters, and time-travel – though one supernatural undead horror story also creeps in amongst the scifi in both issues. There are some definite gems to be had in these two issues, though it’s true that some are still a bit in need of cutting and polishing (and one or two lumps of coal need some time and pressure before they become diamonds). 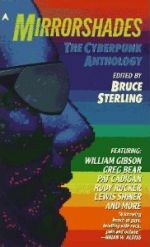 My particular favorite in these two issues is “Brass and Steel” (#6), a steampunk tale by James R. Strickland, author of the post-cyberpunk novel Looking Glass (see interview in RSF#6). “Brass and Steel” is narrated by Dante Blackmore, the marshall of the mining town of Perdition. Blackmore fought for the War Department against the ‘Hive,’ a sort of Terminator-style steampunk-machine revolution which produced ‘Dopes’ (short for Doppelgängers), which are human-looking on the outside, but “full of brass and steel” on the inside. Blackmore suspects that the Hive may not be as dead as most people think, and a young half-Chinese prostitute may be able to confirm his suspicions. From some of Strickland’s recent blog posts, it appears he is in the process of expanding this story into a novel, Brass and Steel: Inferno, and I’m looking forward to seeing it. C.J. Killmer has created a recurring character also worth watching: Lefty Bolingbroke, a one-armed, middle-aged, former Confederate soldier turned gun-for-hire who appears in both issues. In “A Sackful of Morgans” (#5), a steampunk inventor offers Lefty a prosthetic arm good enough to quick-draw his Colt in a gunfight. In “Diablo Dodd’s Dirigible” (#6), the gunslinger confronts an old wartime nemesis who is using an airship to massacre Apache villages. Lefty has an inherent charm and grit which has one rooting for him even when he behaves like a cardboard hero, and I’m looking out for his next adventure. One story in particular intrigued me mainly because of who wrote it. Issue #5 includes a reprint of Jack London’s “A Thousand Deaths.” (Yes, the Call of the Wild Jack London.) It’s not technically a scifi-Western according my definition, since while it is set in the right time period it’s not set precisely in the Old West, but even further west in the Pacific Ocean. Still, I’m glad Riley included it. Originally published in the May 1899 Boston-based fiction monthly, The Black Cat, it earned London, according to his own notebook, the “first money I ever received for a story.” It recounts the experiences of a man whose father holds him prisoner and kills him over and over again in order to perfect a new scientific technique for resurrecting the dead. (It also includes a disintegration ray.) Who knew London wrote scifi? Even if it’s not one of London’s best works, Riley is certainly correct in his editor’s note that “London’s worst is better than most writers’ best,” so it’s worth a read. Lou Antonelli, whose stories are collected in Fantastic Texas and Texas and Other Planets, also has a reprint in issue #5. In “A Djinn for General Houston” (originally appearing in Surprising Stories), the narrator spins a delectable yarn about antediluvian technology, offering to tell the ‘true’ story of the ‘Yellow Rose’ of Texas and the defeat of Santa Anna (and gives a reasonable scifi explanation for Aladdin’s lamp along the way). 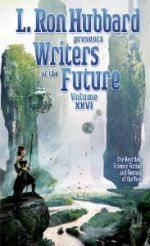 Other notable stories include David M. Fitzpatrick’s “The Gunslinger’s Code” (#5), which proves there is no honor among thieves, and David Lee Summers’s “Pirates of Baja,” which puts a steampunk version of the Confederate submarine Hunley off the coast of California. Unfortunately, rather than giving me my scifi-Western fix this month, all these tall-tech tales only whetted my appetite for more. I’m not sure I can wait another 29 days for Cowboys and Aliens to open. Maybe I should find something else to read…. It’s too bad the webzine Space Westerns is kaput (for now?). That was all they did. 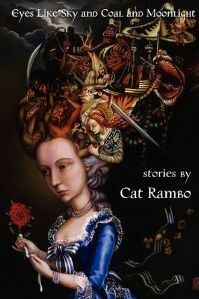 I liked some of the stories, and even sold them a couple. (Sorry mobile phone) …and “how the west was weird volume 2” by Russ Anderson and pulpworks press is another. In addition the magazine “tales of the talisman” is known for publishing weird westerns. 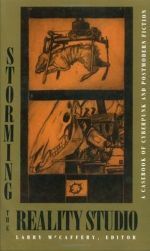 In addition to “how the west was weird volume 1” and david riley’s newest weird western anthology should keep you busy until the movie comes out. I’ve done panels on both weird westerns and steampunk if you ever want to chat. It’s 1 of my favorite topics. This article was quite unexpected. Our website has our latest offerings on it and the two issues mentioned [#5 & #6) are available from newsstands and bookstores. The comment above from Mr. Boop isn’t entirely accurate. We do have two horror weird western anthologies out, but I now believe that western sci fi and the [horror] weird western have morphed into two different genres, though they have common roots. He seems to still want to lump them all together. And I also can’t wait for Cowboys & Aliens.